Celebrate Mickey Mouse's Birthday With a DIY Steamboat Willie Dress! November 18th is Mickey Mouse’s birthday! It marks the day that Mickey made his first appearance in the black-and-white short film Steamboat Willie. To commemorate the birthday of everyone’s favorite mouse, I made a super simple DIY Steamboat Willie dress for my daughter. I made it a little on the longer side, so she could wear it this year and next on our trips to Disney (since the shirt is stretchy). The DIY instructions allow you to make the dress the desired length you would like! Take the waist measurement of the child you’re making the dress for, as well as the desired skirt length. Draw a rectangle on your grey fabric to match the width and length of the measurements you took, but add on about 7 inches to the width. Hem the sides and bottom of your skirt with your sewing machine. For the un-hemmed side, use a wide stitch setting on your sewing machine and sew a straight line across the top, leaving a wide piece of string on both ends. Use the loose threads to cinch the skirt to the waist measurement length, giving the skirt volume. Sew the skirt onto your shirt, un-hemmed side tucked in so it doesn’t show. Hand sew on your two white buttons. 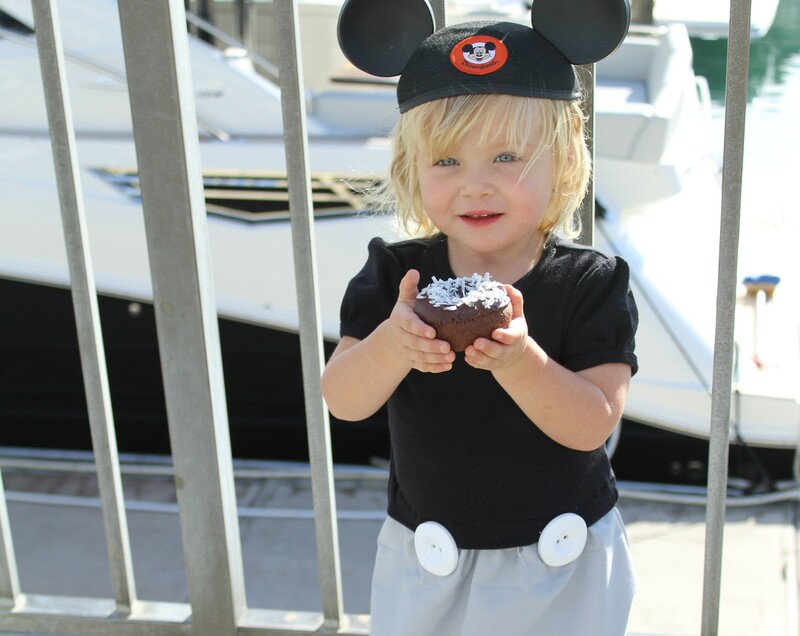 After making her simple DIY Steamboat Willie dress, we put on my daughter’s Disneyland Mickey Mouse ear hat and took her down to our local harbor (what better setting for a Steamboat Willie photo shoot? ), and had a celebratory gluten-free black and white donut from a nearby bakery. Happy Birthday Mickey, to many more magical y[EARS]. Have a Lion King Viewing Party!